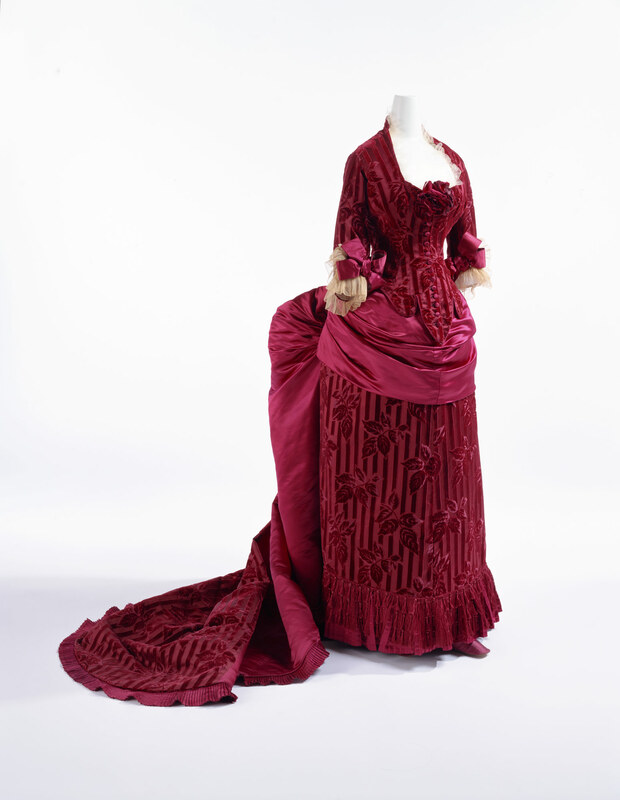 Wine-red silk satin cut velvet with stripes and leaf pattern; figured additional cut velvet layer on leaf pattern; set of bodice and skirt with bustle; tulle and silk satin bows at cuffs; apron-shaped overskirt draped toward back. This dress of silk satin and cut velvet stripes is scattered with a roseleaf motif of cut and uncut velvet, causing shading of the motif. These beautiful materials, with a woven thickness created using complex techniques, show the high quality of Lyon silk textile. The overskirt, draped and gathered into an apron style, and the train greatly contribute to the dignified production of this bustle style dress. Charles-Frederick Worth (1825–1895) employed Lyon silks abundantly. These silk textiles, used without a hint of frugality in the voluminous dresses in that time, were spread through the whole world as brand-new fashion. Lyon outstripped other production areas in terms of technology and craftsmanship, became firmly established as the source of the fabric used in the Paris Haute Couture.